The chocolate salame is a traditional Italian recipe usually made for kids but loved by everyone: it’s a mix of cookies and chocolate, covered in powder sugar and cut into slices. To impress, it’s sometimes tied like a proper salame with string. The main ingredient of this sweet salame are the cookies: you must strictly use dry cookies (the Digestive are perfect) to which you will add the butter and the other ingredients. Butter cookies will make the salame excessively heavy and fat, while the dry ones will maintain the right balance between the various ingredients used. As for the consistency, this chocolate salame should be soft in the area with chocolate and hard in the part of the cookies: for this reason, the cookies should never be blended but should be broken roughly with your hands. If you crumble them in a blender, the final result will be a chocolate dough with a vague hint of cookies, instead if you crumble them with your hands, the consistency will be perfect and the taste will be as well. The chocolate must be bitter and in a tablet; I strongly recommend not to use bitter cocoa because you will not be able to get the consistency you want. Raw eggs, that must be fresh and of excellent quality, are mandatory for a real Italian chocolate salame recipe; once your salame is ready, do not forget to put it into the freezer to harden. This is a topical moment, because it will kill all the bacterias in the eggs making it safe to eat the raw chocolate salame. Also, this step will also give the salame the perfect hardness. Here is the recipe for a classic Italian chocolate salame to be prepared in literally no time. Below the recipe, some tips and more ideas for your chocolate salame. 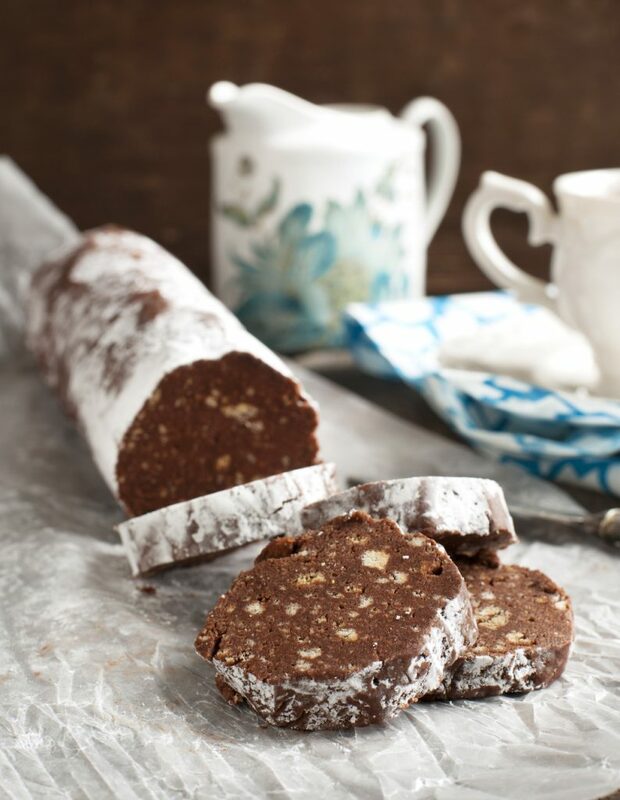 Pull it out of the refrigerator, remove all the aluminum paper and roll the chocolate salami into the icing sugar. Serve the sliced salame or put it on a cutting board after having “tied” it with kitchen string just as you would do with a normal salame. This chocolate salame should always be served cold because if it heats up it loses consistency and flavor.